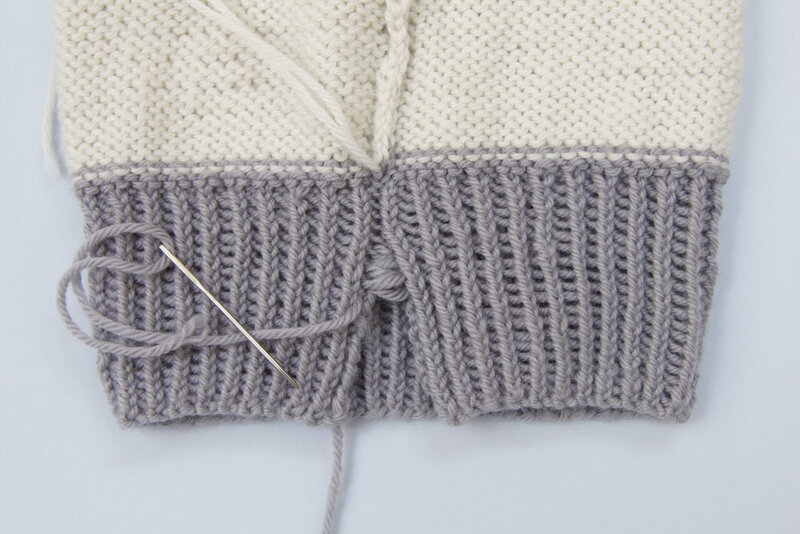 The best way to join two vertical edges of knitting together with an invisible seam is to use mattress stitch. Mattress stitch is great because it’s secure yet flexible and in my opinion really satisfying to do. a length of the yarn you are working with. If possible use an existing yarn tail to avoid adding in any extra ends to weave in later. Make sure you follow a clear line of stitches down your work, picking up the bar between the very edge stitch and the next row in. This will create a seam that is as invisible as possible. If your knitting has different colour sections as in the image below, always work the seam with yarn the same colour as your knitting. Using a different colour will look messy if the work is stretched. Taken from my Roll Up Beanie Challenge; a free email guide taking you through one of my knitting patterns with photo guides and video tutorials so you can learn to knit as you go! Pop your email address in below to join my Roll Up Beanie Challenge; a free email guide through my Roll Up Beanie knitting pattern with video tutorials and photo guides so you can learn to knit as you go while ending up with a sweet little baby or toddler beanie.